The Arts Office at NUI Galway has had to be organic and inventive in order to make space for new and emerging artists and to provoke a response from a largely online audience. In 2000, NUI Galway won a Allianz Business to Arts Award for its partnership with Bank of Ireland when The BOI Student Theatre was launched as a state of the art 80 seat, black box, performance space. The same year an Arts Officer was installed in the University and an ambitious Arts programme was planned. A period of phenomenal growth in numbers of students followed, with enormous pressure on venues and resources. Information and cultural experience became a virtual exchange with digital archives super-ceding cultural events. The success of the digitised Abbey Theatre Archive helped to move NUI Galway up the rankings of Research-led Universities. There was no longer physical or psychological room for live encounters with cultural events. How did we tackle this challenging environment and make art visible? We had to take stock and take control. The Arts Officer and a small part-time and casual team had to stand up and be counted, to be inventive. We worked with what we had around us: first and foremost, an Art Collection; second, an established Múscailt Arts Festival with access to a large outdoor public space; and third, hidden treasures on campus, awaiting an outing, most notably in Zoology and Geology. The Art Collection revealed itself to house over 560 pieces, once we counted them. A wonderful resource, underused, only spotted on the walls of the management offices in the Quadrangle. Our mission was to take everything out of storage, photograph and document all pieces, place them in public areas of the campus and populate every building including offices and stairwells. We created a public database and found we were well ahead of many other collections in Ireland. We encouraged all of our staff to access and use the images in the collection as covers for publications and to forge identities for projects. The dividends to having an accessible database to show off our wares have been noteworthy. New bequests and donations are now a regular occurrence, including a rare 15ft high wooden sculpture “Banbha’s Warrior”, by James McKenna, donated by Desmond Egan. It stands proudly in our new “Life Course and Society Public Research Building (ILAS)”. James McKenna sought to sculpt and capture the Soul of Celtic Ireland and this warrior looks as if he is striding across the land with purpose. 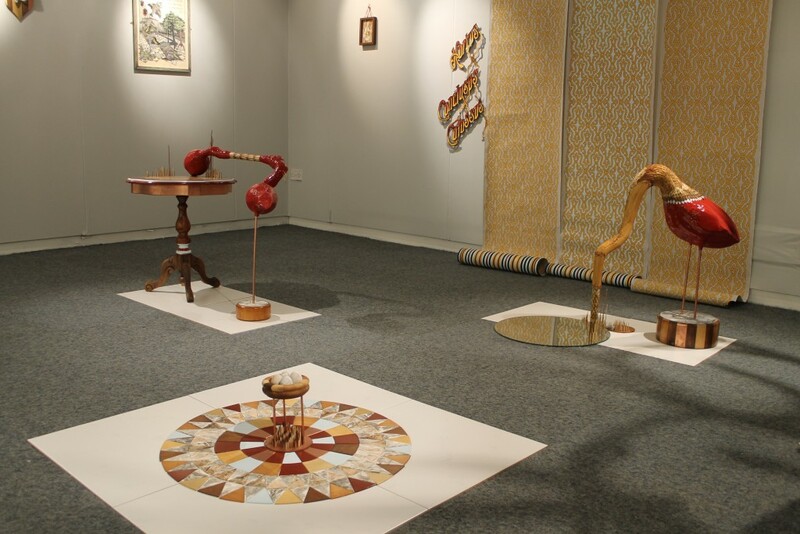 We are committed to increasing the awareness of our heritage and to the encouragement of new and younger artists. MUSCAILT Festival meaning ‘to awaken, to inspire, to create’, takes place in early spring and encourages original ideas and events, visual, performance, happening, dance and film from artists, students and staff, all open to the public. We commission new work, showcase new work and facilitate ‘happenings’. Our natural challenges in the West of Ireland in springtime are rain, damp, dark and isolation. Add to these a lack of venues. Drastic measures are called for as we seek to connect with our audience and inhabit the campus. Our themes became ‘Float Away’ in 2015 and ‘Stand Your Ground’ in 2016. Artists are natural collaborators. James Fleming, Sculptor and Director of Colours Street Theatre, believes that Art should be free and he creates pop-up, recycled and reusable artworks. His sculptural works are temporary and regularly inhabit our campus. His repertoire includes swans made of piping floating in the Corrib, and the magnificent floating fish, entitled ‘Creatures of the Campus’ as seen in our glass boxes above our canteen in Múscailt 2016. Another Múscailt collaborator is Donnacha Cahill the Sculptor. He had previously built a large metal gramophone structure for the Electric Picnic. 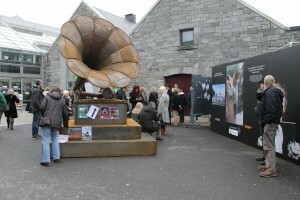 Together, we customised this design and built a portable gramophone for the Múscailt Festival, ‘Romantic Notions’, 2 metres high that could be transported literally anywhere and became a sound system, a microphone and a portable stage/venue in its own right. The gramophone travelled throughout the festival and everyone engaged with it. It was FUN. So much fun, it was then taken up by Galway International Arts Festival and gained even more notoriety on the streets of Galway. Artists Anne O’ Byrne, Aideen Barry, Ben Geoghegan and many more have created new temporary sculptural work in situ. The expertise and experience we have in this field will allow us to move into the realm of public and permanent sculpture. Our new mission is to populate the campus with fun and serious sculptures to forge new identities of place within the landscape, create meeting points and social spaces and to become an open-air public resource. The proposed greenway from Galway city to Moycullen will pass through NUI Galway, along the Corrib River, and we have a wonderful opportunity to open our campus to the world. Lastly, to our hidden treasures, kept in the Zoology and Geology Collections among many others. There is a resurgence of interest in the OBJECT. In fact, we have a priceless collection of hand-blown marine specimens by the Blaushka Father and Son. They are original recreations of marine species discovered in the mid-1800s and being transparent they also embody delicately coloured internal organs. They are still used to this day. The Geology Museum houses fossils, precious stones and gems, including a Neanderthal skull. Marielle MacLeman was the perfect artist for a residency at Geology and Zoology, the result of which is much more than a sum of the parts. It all began with one Albert Finch, a fictitious museum keeper that morphed himself into some of the objects. Museum keepers were notorious for burning collections held in high regard by previous keepers and for re-labelling collections to suit their own views and generally re-modelling the world. Were they the first artists-in-residence then? MacLeman’s exhibition was titled ‘The Rise and Fall of Sleeping Finch’ with meticulously created sculptural objects, made from hundreds of tiny pencil shavings, hand-cut miniature wooden triangles, stuffed animals, medals, rolls of wall-paper, and more. Her new pieces complemented the existing collections. As part of our expanding collectionwe purchased some sculptural objects and wall-mounted artworks and installed them in the public foyer en route to the Zoology museum. They seamlessly knit the artist, viewer and scientist together. We will move onto the Anatomy Department and Physiology Department in an organic way as they both prepare to move from historic buildings to a new ones. Perhaps it is the perfect time for an artist in residence to create something new to complement these changes. Students are not forgotten in all this. During the last 3 years the Victorian Society was born on campus and held two Victorian ‘funfairs’ during Múscailt Festivals. These funfairs house inventions, boardgames, steam-punk, science, artwork, literature, tea, cake, pies, costumes and good old Victorian conversation, all in a suitably large sociable space. It is a huge hit and set to continue. That suits us in the Arts Office at NUI Galway as we embracing the impromptu, the pop-up, the tactile, the sculptural and the object. We are happy to support new and old ideas. Kris Nelson, Director, Tiger Dublin Fringe Festival, Anna O Sullivan, Director, Butler Gallery, Damien O Neill, Head of Marketing, Allianz and Mark Deering, Director, Sky Ireland in GPO Witness History to launch the Allianz Business to Arts 2016 Arts, Festivals and Music Sponsorship Report. Allianz and Business to Arts have published the results of the second Arts, Festivals and Music Sponsorship Survey, following on from the success of the recent 25th Allianz Business to Arts Awards in September. 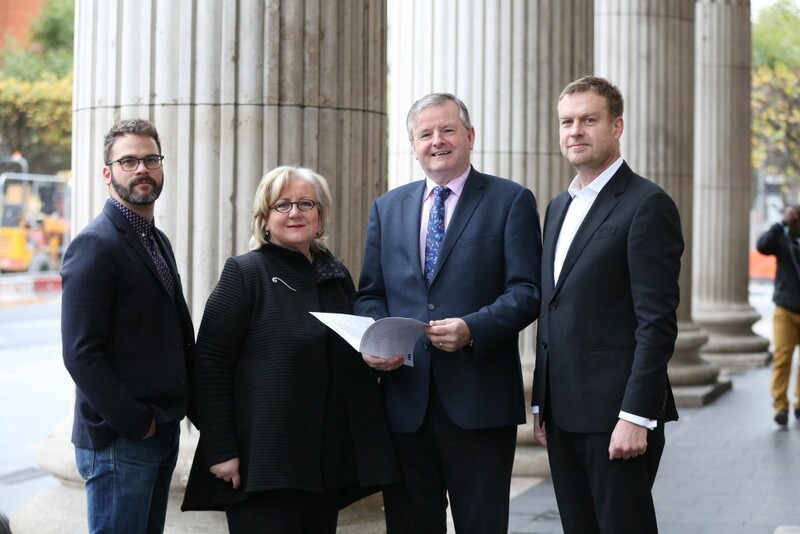 The summary report, launched at GPO Witness History, was drawn up by Business to Arts from data supplied by sponsorship and marketing managers, adding to the membership organisation’s research and insight services for the leading corporate sponsors of the arts, festivals and music. The survey looks at sponsorship objectives that differentiate the arts over other types of sponsorship areas; at sponsorships that are both one-off event relationships or multi-annual partnerships; sponsorship spend between 2015 and 2016, as well as anticipated spend in 2017; methods used to activate relationships; measuring success; and a peer-review of the leading cultural sponsors in Ireland. “2016 marks the 25th year of the Allianz Business to Arts Awards and Allianz is proud and privileged to continue to play its part in this process of continuous renewal, individual fulfilment and ultimately, societal enrichment. Whilst the awards highlight and facilitate this positive reality, the 2016 Arts, Festivals and Music Sponsorship Report is based on the experiences of all involved in the 2016 year. It ensures that their experiences and insights are recorded and shared. This helps safeguard the continued delivery of substantial cultural, economic and commercial benefits for years to come”.